Just some stock analysis of random companies. Hope my analysis can be a source of reference for investors! I have set my mrinvestor12.blogspot to redirect people to the new address, but it seems sometimes i do get comments. Apologies for not answering your queries, yes, the blog ate up the comments and I do not know why. Could you put comments on the new address and I will revert to you. Note the change in financial year end from 31 December to 30 June. Hence, for financial year ended 30 June 2016, the results were for 18 months. Hopefully, after leaving its loss making ventures behind, this company can continue to make sustained profits. 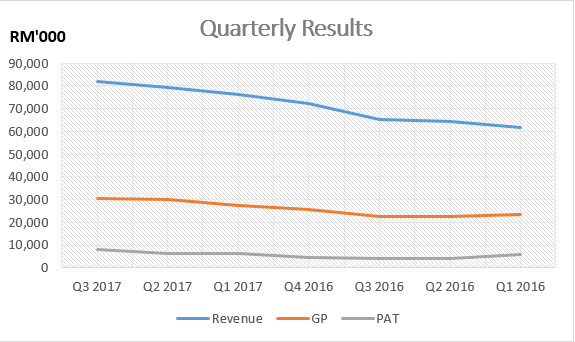 A noteworthy point is that despite its process equipment division recording losses in 2014 and 2016, it still managed to record a net profit as the losses were cushioned by its transformer and lighting division. It was noted that the profit margins for its transformer and lighting division were consistently above 20%. 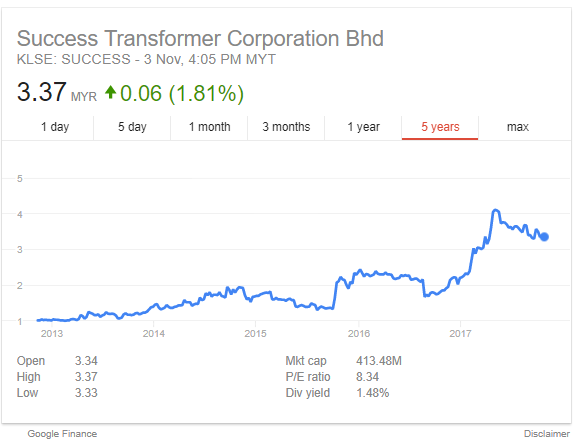 The share price of Success has been consolidating for almost 6 months since May 2017. 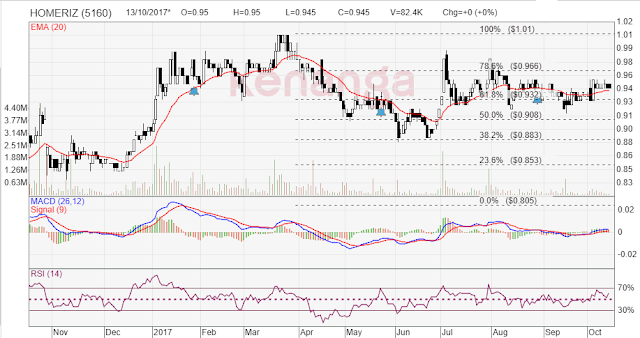 Its share price reached a high of RM 4.26 in May 8, 2017, before retreating to RM 3.37 in Nov 3, 2017. Probably there will be more consolidation ahead. Judging from its price action, there are no clear indications that price consolidation may be ending. There is just a lack of momentum in its share price. 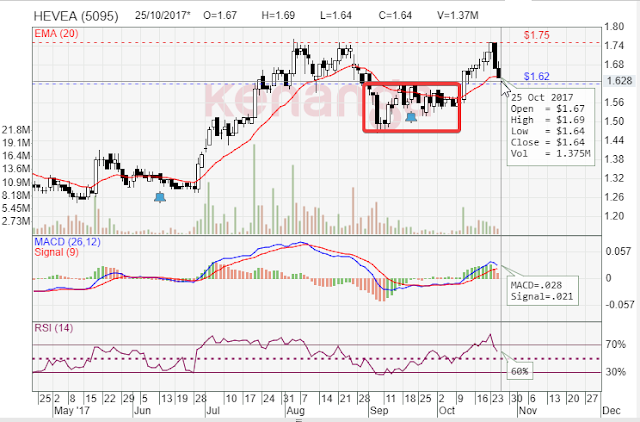 However, I noticed that there are some accumulation going on when prices trade close to support at RM 3.22; this was evident in the spike in volume -- refer Chart 3 above. Market sentiment is still as bearish as ever. Despite the announcement of the 2018 Budget, the market is still anaemic. Refer to my article on market sentiment HERE. 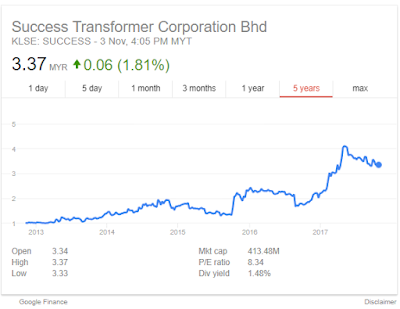 In light of the improvement in its process equipment division, Success Transformer should be poised to trade higher. Its EPS for financial year ended was its highest in 6 financial year ends, 40 cents -- see Chart 2 above. Note: This is not a recommendation to buy or sell this stock. The writer does not own shares in this company. The writer intends to share his view point on this stock's potential investment value, any decision to invest or sell shares in this company is entirely at the reader's own risk. Probably, because prices retraced about 50% from its previous rally. Note that the previous rally began in the highlighted RED rectangle - September 2017 - in Picture 1 above. Also note that the current retracement to RM 1.64 is a 50% retracement from its previous rally; in Fibonacci terms, it has retraced to a healthy level for prices to continue on its uptrend. In my opinion, the consolidation zone in the highlighted RED rectangle in September 2017, was a healthy consolidation zone which led to a breakout on October 11, 2017. 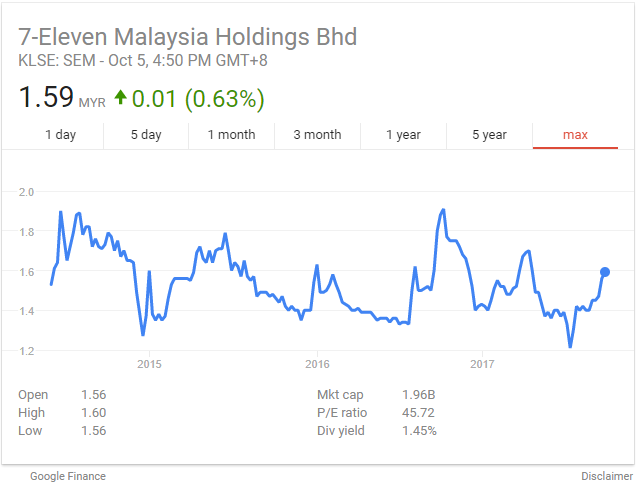 Since my last review of Hevea, the USD has appreciated against the MYR from 4.2050 (12 September 2017) to 4.2352 (25 October 2017). This does not immediately improve the results of Hevea's Q3 2017 results, but this is a sentiment booster for exporters like Hevea. So what's up for us? I will be monitoring this stock for some time. 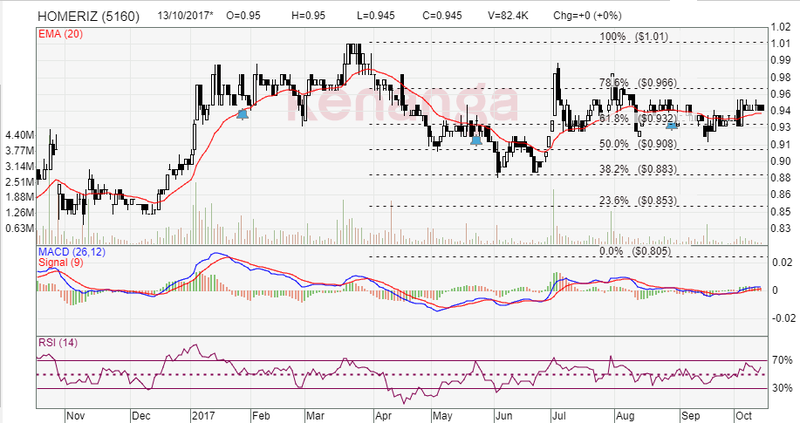 However, the zone in which Hevea is trading at deeply intrigues me. If the support level holds, no issue. But if prices break below support, I will probably look to add my position. For me, it would definitely be market sentiment. 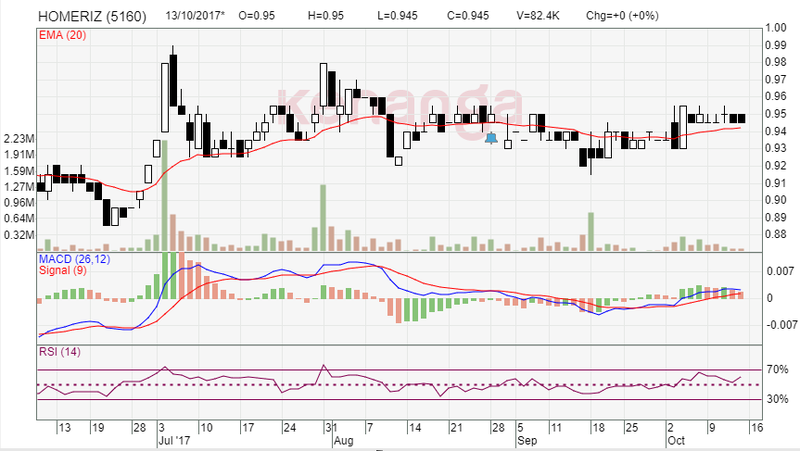 Despite price action showing some promise, if overall market sentiment is bearish, Hevea's prices may be pressured lower. 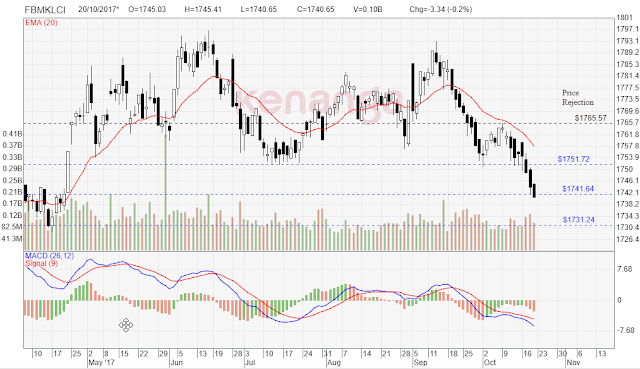 Check out my analysis of FBMKLCI's bearish sentiment lately HERE. For those who are wondering when is Hevea's next quarterly announcement for Q3 2017, it will be at the end of November. I strongly encourage those who want to know more about the FUNDAMENTALS of HeveaBoard to check out my analysis HERE. Note: This is not a recommendation to buy or sell this stock by the writer. The writer owns shares in this company. The writer intends to share his view point on this stock's potential investment value, any decision to invest or sell shares in this company is entirely at the reader's own risk. If the support level of 1,742/1,741 fails to hold, further downside is expected. I expect the next support level to be at 1,731. The MACD is looking bearish, and the down trend seems to be persisting until it reaches its support; hopefully, the down trend in the index will be halted at its immediate support level of 1,741 / 1742. The chart above resonates with bearish sentiment. 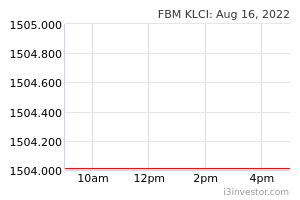 As we know, the FBMKLCI tracks 30 companies. Hence, selective stock picking is essential during this time. Personally, I will be staying at the sidelines looking for an opportunity when things are bearish. Check out The Star Business's Friday 20/10/2017 end of day report >> HERE. 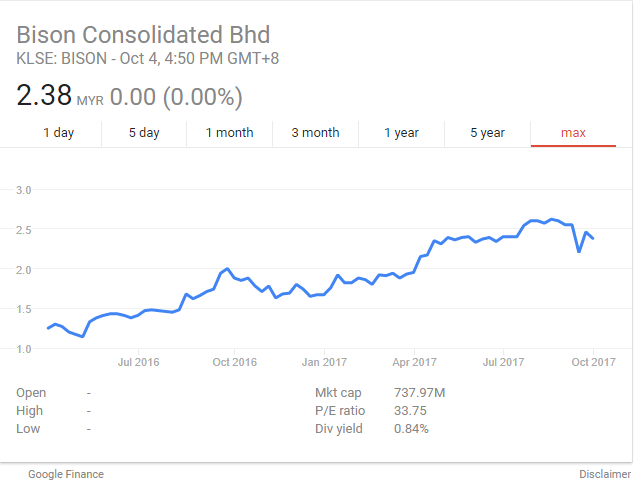 Bison Consolidated Berhad (5275) is a dynamic convenience store company listed on the Kuala Lumpur Stock Exchange (KLSE). 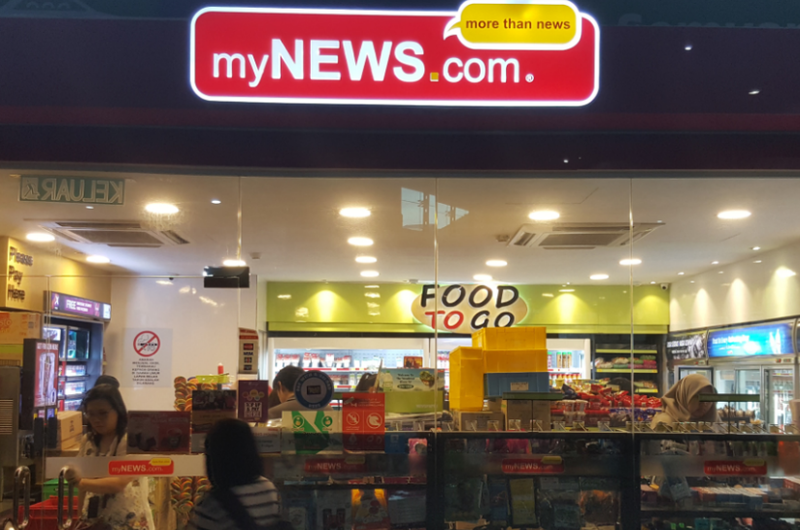 It has grown many folds since it first opened its myNEWS.com store in 1996. 11 years later, it has opened about 300 stores in Malaysia. 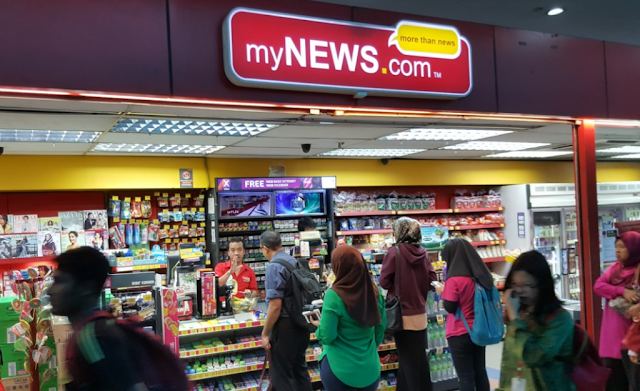 In 2012, Bison entered into a joint venture with WH Smith Travel Limited to operate WH Smith news, books, travel and convenience stores in Malaysia. My first impression about the convenience store business was that this is a saturated market - apparently NOT. The thought of many convenience stores come to mind - 7 Eleven, 99 Speed Mart, KK Super Mart, NZ Magazine Centre, Family Mart, K Mart and etc.. All of the stores aforementioned compete within the convenience retail segment. Since its listing on the KLSE, the share price has surged almost 100% from RM1.10 to RM2.38 in one and a half years. The surge was mainly driven by the growth story that the convenience market in Malaysia is under-served and there is ample opportunity to add more stores in the future. From an investor's standpoint, I'm trying to relate the growth in share price with its growth in the number of stores and improvement in its revenue and profits. Let's see how its financials stack-up against the growth in its share price. Chart 2 above is a chart on its quarterly results. Based on an analysis of its quarterly results, revenue and profit after tax have been growing steadily. Chart 3 above is a summary on the financials of Bison. Compounded annual growth rate (CAGR) for the past 4 years for revenue was about 14% while total stores was 15.2%. A key takeaway from Chart 3 is that its joint venture had an impressive CAGR of 135%. On a side note, the higher profitability in 2013 was due to a gain of RM6.1 million from the disposal of property, plant and equipment. If this one-off gain were to be excluded from the financials, profit before tax margin was 10% while profit after tax margin was 7%. Since this industry is expected to experience growth, let's look at how its biggest competitor has performed historically. The idea of analysing how its competitor has performed is a good indication of growth in this industry. Further, 7 Eleven is an established convenience retail store with a proven track record. In the next few paragraphs, we will explore the growth of 7 Eleven in the convenience retail segment and relate it to Bison. Growth is evident in 7 Eleven; it added 586 corporate stores from 2013 to 2016 and recorded a CAGR of 9.2%. During the same period, Bison recorded a CAGR of 15.2% and added 131 new stores. It should be noted that Bison's profit after tax margins are much higher than 7 Eleven's throughout the comparative period. 7 Eleven's price to earnings ratio (PE) averaged 33 times. 7 Eleven's share price, however, has not made much progress since its IPO, and now it trades at a PE of around 45 times. Refer Chart 5 below on the performance of 7 Eleven's share price. Bison recently announced a private placement to raise additional capital of approximately RM77.5 million through a rights issue. In addition, a 1-for-1 bonus issue, and an employee share option scheme (ESOS, 10% of total share capital) was also announced together with the placement. The purposes of the private placement are to purchase industrial warehouse land for warehousing space (RM50 million), construct and develop its food packaging and preparation facility on a piece of land in Rawang (RM20 million) and for working capital purposes (RM4 million). Both JVs will be housed in Rawang. The products of both JVs are to be sold by Bison convenience stores. The funding of both JVs totals RM35.7 million, which will be funded partially by internally generated funds, and the balance of RM20.4 million by the private placement. The company's expansion plans seem to be on-track. Growth is evident in this industry - even 7 Eleven which had over a thousand stores in 2006, added 901 stores over a span of 6 years (refer Chart 4). 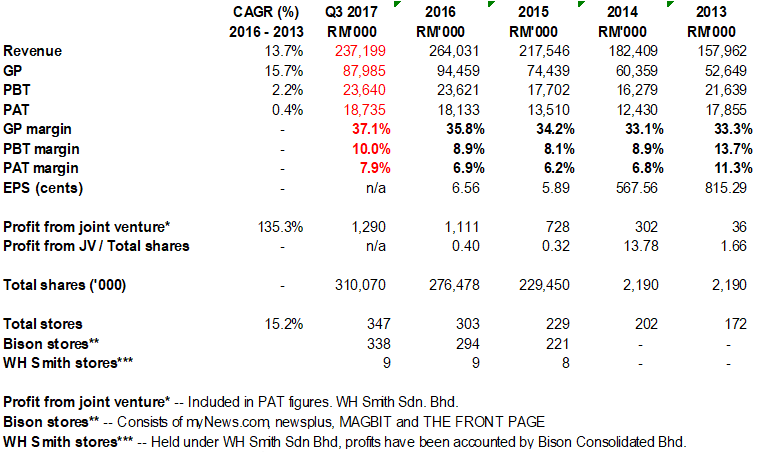 And in 2015, based on the market research by Smith Zander attached in Bison's prospectus, Malaysia had 135.1 convenience stores per million persons, which is lower than most developed countries. As of April 2017, approximately 65% of its issued share capital are held by the major shareholders. Also, retail participation in this company is noted to be low. The average investor should be aware that investing in Bison does not come cheap as its share price is over 30 times its earnings per share (PE). Even its competitor 7 Eleven, trades at a PE of over 40. Opportunity for growth in the convenience store segment is evident as long as the company manages to identify urban spots where foot traffic is high - which I do not think is too difficult. Through its concerted efforts, Bison has been striving to increase its market presence in Malaysia. 7 Eleven adds on average of 150 stores per year from 2010 - 2016, which is much more than the number of stores Bison adds per year. Moving forward, from the JVs entered into with its Japanese partners, Bison's convenience stores will be able to sell attractive Japanese food products; similar to how QL's Family Mart sells its food products in Malaysia. This will give it a wider array of products to sell and will definitely capture on-the-go hungry customers. However, with the potential increase in shares due to the corporate proposal which has been approved, EPS would be diluted. Also due to a high PE, growth expectations are high and if investors' expectations are not met, prices can easily be pressured lower. The lay investor does have a reason to be sceptical due to the relatively high PE this company is trading at. Considering the potential introduction of additional shares in the market from the corporate exercise, investors should question whether the additional capital investments will bring in future growth and profitability to this company before committing to this investment. Nevertheless, the writer opines that growth in the convenience retail segment is obvious and the valuation of Bison Consolidated is attractive. Note: This is not a recommendation to buy or sell this stock by the writer. The writer does not own shares in this company. The writer intends to share his view point on this stock's potential investment value, any decision to invest or sell shares in this company is entirely at the reader's own risk. xcel8 Well presented with facts and data.